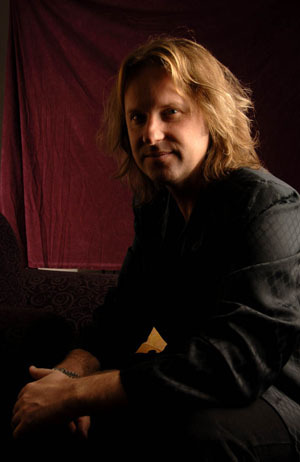 (Los Angeles, 20 October 2006) HOMMAGE SYMPHONIQUE is an album of progressive rock covers recorded by master keyboardist Erik Norlander along with the virtuoso band of Gregg Bissonette (d), Don Schiff (b) and Mark McCrite (g) with Kelly Keeling handling all of the vocal duties. Erik also employed a small ensemble of acoustic instruments featuring Jon Pappenbrook (trumpets flugelhorn), Eric Jorgensen (trombones), Mike Alvarez (cello) and David Schiff (woodwinds). David is the brother of Don Schiff, and in addition to Don's NS/Stick work on the album, he also fills out the acoustic string ensemble with the new Bowed Guitar instrument. Erik's choice of covers reflects his own broad musical taste, performing songs originally recorded by ELP, ELO, Yes, Rick Wakeman, King Crimson, Procol Harum and Jethro Tull and Chuck Mangione. The last artist may sound the most surprising, but Erik's stirring rendition of Mangione's "Children of Sanchez" brings this jazz - fusion classic more into Erik's world of symphonic progressive rock supported by his seasoned and highly versatile band. HOMMAGE SYMPHONIQUE follows the already acclaimed 2CD release, REVOLUTION ROAD, from Erik's band, Rocket Scientists. The Rocket Scientists musicians appear throughout the HOMMAGE SYMPHONIQUE album continuing the artists' collaboration and bringing it to new heights. HOMMAGE SYMPHONIQUE is being released simultaneously with Lana Lane - GEMINI, a collection of classic rock songs produced by Erik, sung by Lana, and featuring an amazing group of rock musicians. I know there are those out there who would consider that a CD of covers is not worthy of being a real release. Well, I'm here to tell you that if you have that attitude you might miss out on what could well be the best prog disc of the year. If you listen to only one covers album for the next year, this should be the one. The selection of music is certainly complex enough to present a huge challenge - yet Norlander and his guest artists have met that challenge admirably. They don't stray too far from the originals, yet there's plenty of creativity here - and despite the differences between the original songs and the artists who recorded them, Erik manages to maintain a certain cohesion through the whole piece. Give Erik Norlander credit for not recording a typical tribute album. For one thing, the virtuoso keyboardist doesn't rely on the same tired material as other artists when they cover, say, Yes or Jethro Tull. And who else would dare try a Chuck Mangione song? Only the most faithful fans of the artists to which Norlander pays homage on Hommage Symphonique will likely be familiar with all of the material he's chosen here. Secondly, he pays his respects to each song while remaining true to his own symphonic-rock tendencies. Norlander's stamp is all over this record, even though he penned none of the songs. Doing just under fourteen minutes of ELP's "Pirates" may sound a bit like committing ritual suicide on a bizarre scale, but in Norlander's hands, it becomes a triumph as he provides everything you would expect from such a version and embellishes it with orchestral, synthesized and huge-sounding colorations, the result being an epic that ELP could never have dreamt of creating and an absolute blincer of a version that eclipses any version I've ever heard from the ELP mob. The most accessible on the disc is opener Conquistador which has a very memorable sounding melody line that quickly sticks in your head like a nasty piece of bubblegum under your shoe! But in case of Conquistador it's not a bad thing as this is an admirable song making me curious about Procol Harum's original. The little trumpet noises attribute to the triumphant atmosphere of the song. So right away we have a winner here with singer Kelly Keeling doing a tremendous job. 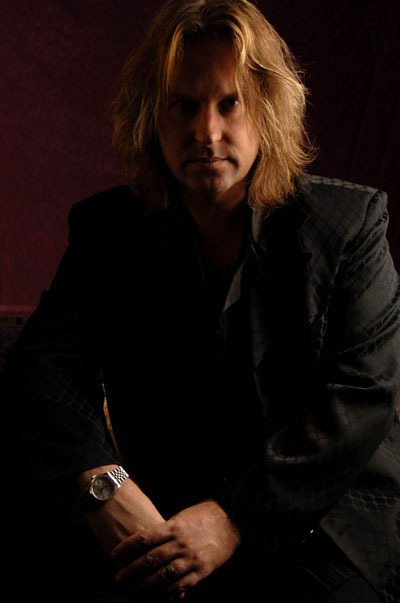 Kelly Keeling has become a household choice for doing the vocals as, by now, he has participated on a lot of Erik Norlander's releases. But I can't really object to that because on this album he really shows he can manage a variety of different styles with seemingly ease. Rather than go for the obvious songs he has chosen the kind of tracks he really likes listening to, regardless whether these contain huge amounts of keyboards. In fact, the challenge here has been to replace certain instruments by keyboards as he does in "Turn Of The Century" where he replaces Steve Howe's guitar with piano. That's inventive and daring at the same time, as surely we all know these songs so well that it virtually is sacrilege to even think of re-arranging bits and pieces. Hommage Symphonique is an excellent prog rock album, with not so standard music on it. I can only say the choice of songs is very good, as they are not the most obvious ones and can be a reason to look up the originals. I've talked about solo efforts by keyboardists in the past, how sometimes they don't live up to expectations for one reason or another. 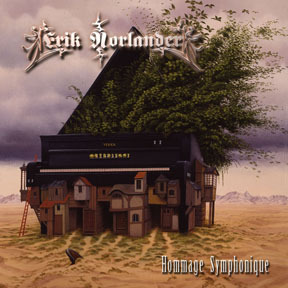 Erik Norlander has sidestepped the many pitfalls and produced Hommage Symphonique which is essentially a cover disc of some of his favorite progressive rock pieces....This is really a great cross section of styles that work really well together. Instead of your average, run-of-the-mill covers album, Norlander takes the unique approach of transforming underground prog-rock classic of the seventies and turning them into a fusion of symphonic jazz. ....Even without a full orchestra, Erik Norlander's ivory tickling nicks the need for one, for which Hommage Symphonique adheres to the true form of symphonic rock, the same of which was created by Rick Wakeman & Keith Emerson. Prog keyboard maestro Erik Norlander tributes his influences in unique and intense fashion. Erik's versions of songs from Yes, King Crimson and ELP among others are very well-crafted.....Erik once again enthralls the listener with technique and flair. ....this album will make you feel nostalgic and you will immediately play the original songs as soon as you listened to it… conversely, if you're a new fan that's liked prog music and you do not know from where to start... then this album will guide you in the right prog 70s direction… when music was beautifully complex and melodic. ...In what concerns tribute or version albums, Hommage Symphonique is one of the better achieved works that I've listened to recently. A true and capable tribute to some of the bands that have influenced his [Erik Norlander] work. A work of respect that must be acknowledged. Most progressive rock fans will see tracks they know particularly well and this is why the album got my attention. I think the music does stay true to the originals with the arrangements put together with obvious care. However, don't expect exact copies. Good musicians will offer their personal interpretations and I think this comes across particularly well on the tracks that sparked my interest. Mr Norlander has chosen some progressive rock diamonds, some of which are not so popular. Everything about this album has been executed brilliantly. Hommage Symphonique is a very special, though in some ways a rather quirky and eclectic collection of some of Erik Norlander's favourite songs, and far from the comfortable ride he might have delivered. It is a journey that I look forward to sharing many times in the future. It's great to hear such classics as "Conquistador", "Turn of the Century" and "Starless" done by ERIK NORLANDER and friends. Another nice addition to the growing catalogue of releases featuring ERIK NORLANDER! 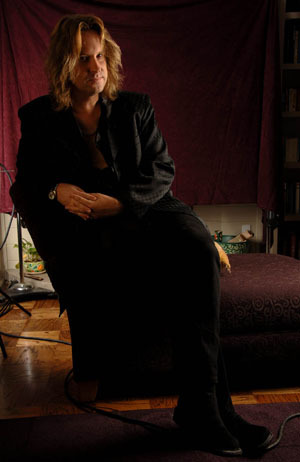 When I say Erik Norlander is the modern day Rick Wakeman, I mean that Erik Norlander is the modern day Rick Wakeman. Rick Wakeman is alive and well, I had the pleasure of seeing him twice in Australia since 2003, Once with Yes, and once solo. He is still the best, the Babe Ruth of keyboard players without doubt. That being said, Erik Norlander is the finest I've heard from the generation of keyboardists that have followed. Erik's new release on the Think Tank label will leave a pleasurable taste on the musical tastebuds of fans of top shelf prog rock.